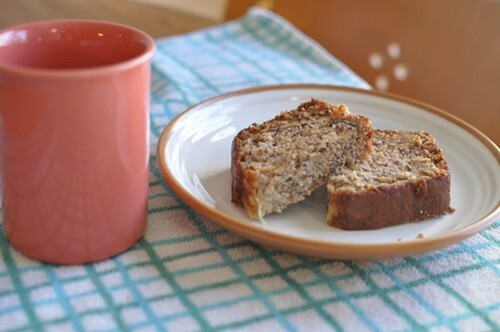 I've yet to find anything more comforting on a chilly day than a warm, thick slice of banana bread with a tall glass of milk. This is my mom's recipe and it couldn't be easier: seven ingredients, mix, mash, pour, bake. You have my permission to eat it for breakfast or dessert — or both. Whisk the eggs in a large bowl. Mix in the sugar and oil (or butter). Add the flour and baking soda; stir until well combined. Add several shakes of cinnamon. In another bowl, mash the bananas finely with a fork. Add these to the other mixture and stir. Pour the batter into a greased and lightly floured bread pan. Bake for about 55-60 minutes, until a toothpick inserted into the center pulls out clean.